GPLink’s remote monitoring equipment has been installed on hundreds of Cat powered vessels throughout the world. The company has recently announced that its product has received its first integration on a non-Caterpillar power package. 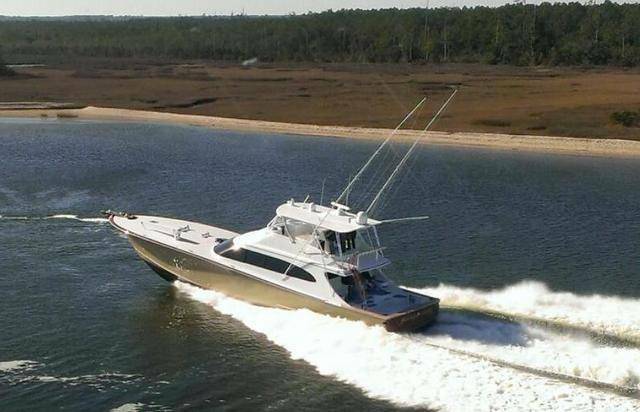 In March, Spencer Yachts splashed their latest build, an 87-foot sportfish yacht named Bangarang, equipped with twin MTU M94 2600 horsepower diesels capable of propelling this mammoth vessel to a cruising speed of 40 knots. These powerful engines are also the first MTUs to receive the GPLink Remote Monitoring system. Factory installed, the GPLink system presented some minor challenges and differences from a typical Cat engine install, but working closely with technicians from MTU and Western Branch Diesel, all of GPLink’s capabilities were successfully implemented. The owner of Bangarang, Dale Murphy, was drawn to GPLink for its vessel tracking capabilities and vast array of components monitoring and alarms offered. Although the hardware and components used during installation on this MTU powerplant differ slightly from the Cat diesel components, all functionality – including all engine alarms remain present for the customer. On her maiden voyage to the Dominican Republic, Bangarang was tracked and looked after through the GPLink tracking software. Since returning stateside, GPLink reports success for this pilot install. 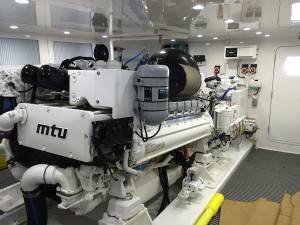 GPLink said Bangarang is just the beginning of itss quest for greater diversity as we have plans to install GPLink Remote Monitoring on generator sets and branch out into monitoring other marine diesel engines brands, including Cummins, MAN Diesel, John Deere and Volvo Penta.